I, Daniel Blake is a 2016 British-French drama film directed by Ken Loach and written by Loach's frequent collaborator Paul Laverty. The film stars Dave Johns, Hayley Squires, Dylan McKiernan, and Briana Shann. It won the Prix du public at the 2016 WAMA film festival in Poland. It won the Palme d'Or at the 2016 Cannes Film Festival and the Prix du public at the 2016 Locarno International Film Festival. Daniel Blake is a 59-year-old joiner living in Newcastle, a city in North East England. Daniel has had a heart attack at work. His recovery is incomplete and his cardiologist is concerned that Daniel's heart might begin to beat abnormally, putting him at risk of developing a life-threatening arrhythmia. She tells him that he is not ready to go back to work. Daniel applies for the sickness benefit called 'Employment and Support Allowance'. He gets it at first, but when an eligibility test is carried out, his points tally is slightly below the threshold needed to keep receiving payments. As a result, he is deemed to be able to work. Daniel had assumed that the unspecified healthcare professional who carried out his Work Capability Assessment — portrayed as a simplistic box-ticking exercise — had contacted his doctor for information on his condition, but she had not. Consequently, the test's criterion for people who are at risk – which would have qualified Daniel for sickness benefits by itself – is not applied by a government "decision-maker". The supervisor at the job centre says Daniel's only option is to claim Jobseekers Allowance. As a condition of receiving Jobseekers Allowance, he must actively look for work. Daniel launches a legal appeal against being found fit for work but he finds it difficult because he is not computer literate. Daniel gets to know single mother Katie and her two children, Dylan and Daisy, who have left a homeless persons' hostel in London and, with no other affordable accommodation being available in the capital, have moved to Daniel's home town, a place unfamiliar to Katie and her children. On her first visit to the Job Centre Katie was "sanctioned" — her benefits were stopped because she briefly got lost on the way there — and she can no longer feed all her family nor heat their flat. Widower Daniel, single-parent Katie and her children try to deal with the problems they face together. They visit a food bank and Katie is overcome by hunger. She is slowly drawn into the black economy, while Daniel seeks work on the local industrial estate and is offered a job working in a scrapyard. He reluctantly turns it down, with his doctor's advice in mind. Daniel's "work coach" feels he is not making enough effort to get a job. Daniel becomes disillusioned and sprays "I, Daniel Blake demand my appeal date before I starve" on the job centre's outside wall. The bystanders sympathize with him, but he's taken away by the police and given a formal warning. Daniel sells most of his belongings and becomes very withdrawn. Finally, Daniel's appeal date arrives. He goes to the appeal court, with Katie to support him, where he meets his welfare rights adviser. The adviser has obtained copies of the medical records and he advises Daniel that his case looks sound. On glimpsing the judge and doctor who will decide on his appeal, Daniel becomes anxious. He goes to the washroom to cool down. Shortly afterwards, someone shouts for an ambulance. Daniel has collapsed. The tribunal doctor is called but finds that Daniel has no pulse. She begins CPR — unsuccessfully. At his "pauper's funeral", Katie reads the eulogy. Principal photography began in October 2015 in Newcastle-upon-Tyne and the surrounding area. The film was produced by Rebecca O'Brien for Sixteen Films, Why Not Productions and Wild Bunch with the support of the British Film Institute and BBC Films. On review aggregator website Rotten Tomatoes, the film has an approval rating of 92%, based on 60 reviews, with an average rating of 7.7/10. The site's consensus reads: "I, Daniel Blake marks yet another well-told chapter in director Ken Loach's powerfully populist filmography." On Metacritic the film has a score of 76 out of 100 score, based on 12 critics, indicating "generally favourable reviews". There have been a wide variety of both praise and criticism of the film from politicians. Former Work and Pensions Secretary Iain Duncan Smith referred to the film as unfair, aiming particular criticism at its portrayal of Jobcentre staff, saying: "This idea that everybody is out to crunch you, I think it has really hurt jobcentre staff who don’t see themselves as that." Producer Rebecca O'Brien responded by stating that Duncan Smith "is living in cloud cuckoo land." Similarly, on an episode of BBC's topical debate programme Question Time broadcast on 27 October 2016, which featured Ken Loach as a panellist, Business Secretary Greg Clark described the film as "a fictional film", saying "It’s a difficult job administering a benefits system...Department of Work and Pensions staff have to make incredibly difficult decisions and I think they should have our support in making those decisions." Loach responded to this by criticising the pressure that DWP staff are placed under. Conversely, Labour leader Jeremy Corbyn offered glowing praise towards the film - he appeared at the film's London premiere with the director, then subsequently praised the film on his Facebook page. In a session of Prime Minister's Questions on 2 November 2016, he advised Prime Minister Theresa May to watch the film, as he criticised the fairness of the welfare system. 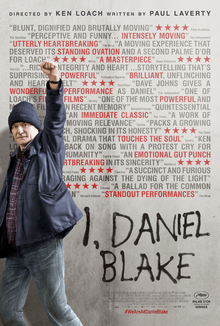 ↑ "I, Daniel Blake (15)". British Board of Film Classification. 18 August 2016. Retrieved 19 August 2016. ↑ "I, Daniel Blake". Box Office Mojo. ↑ Lee, Benjamin (22 May 2016). "Cannes 2016: Ken Loach's I, Daniel Blake wins the Palme d'Or - live!". The Guardian. Retrieved 22 May 2016. ↑ "Cannes Film Festival Winners: Palme d'Or To Ken Loach's 'I, Daniel Blake'". Deadline.com. Retrieved 22 May 2016. 1 2 "Palmarès 2016". Locarno. ↑ Hodgson, Barbara (8 November 2015). "Award-winning director Ken Loach takes to the streets of Newcastle to shoot his latest feature film". Evening Chronicle. Retrieved 25 May 2016. ↑ Solutions, Starlight. "People :: Rebecca O'Brien". www.sixteenfilms.co.uk. Retrieved 26 May 2016. ↑ Gleiberman, Owen (12 May 2016). "Cannes Film Review: 'I, Daniel Blake'". Variety. Retrieved 25 May 2016. 1 2 "I, Daniel Blake". Rotten Tomatoes. Retrieved 30 October 2016. ↑ "I, Daniel Blake reviews". Metacritic. CBS Interactive. Retrieved 30 October 2016. ↑ Evans, Alan (November 1, 2016). "I, Daniel Blake leads British independent film award nominations". The Guardian. Retrieved November 1, 2016. ↑ "Cannes 2016". The Guardian. Retrieved 22 May 2016. ↑ Moore, William (November 17, 2016). "Evening Standard British Film Awards - The Longlist". London Evening Standard. Retrieved November 29, 2016. ↑ "Maudie Wins Coveted VIFF Super Channel People's Choice Award" (Press release). Greater Vancouver International Film Festival Society. 14 October 2016. Retrieved 18 October 2016. ↑ Stuart Derdeyn (16 October 2016). "Maudie wins People's Choice Award at VIFF". Vancouver Sun. Retrieved 18 October 2016.